Internet distribution frees TV networks from the constraints that have defined their business models since inception. The future of TV will look nothing like its past, regardless of what today's giants believe (or do). When we think of the future of TV – or more specifically, the digital future of network TV – we tend to think around key concepts: over-the-top and direct-to-consumer distribution, à la carte availability, dynamic ad insertion, data-driven green-lights and so on. Yet, what’s always missing from this analysis is a more fundamental examination of what a digital network could actually be. One of the primary problems here is the starting point: TV Everywhere. TV Everywhere, to put it plainly, does not a digital network make. It’s about taking a linear product and putting it on the web – not rethinking the network construct itself. At its core, the traditional, linear TV business model is defined by its constraints. Each network has a finite number of programming slots (and even fewer primetime slots), which forces it to focus on maximizing “eyeballs” among a specific target demographic (or demographics) and programming thematically and/or tonally similar content. A digital network, however, faces none of these limitations. There’s no maximum – or minimum – amount of programming required, no limit to the number of genres and demographics it can serve, “no one size fits all” lead in show and no single performance metric. 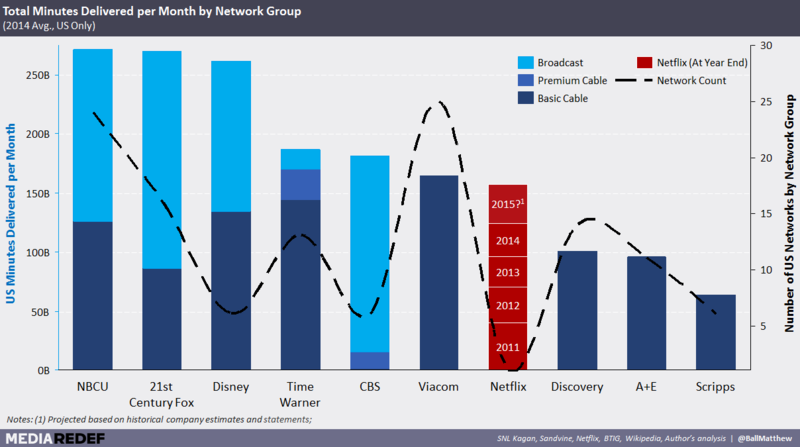 This fundamentally changes what a “TV” network can look like and be. Netflix, for example, can be many things to many people. And it shows. In the fourth quarter of 2014, Netflix delivered more minutes of video in the United States than the average broadcast network, twice as many as the industry’s largest cable network (The Disney Channel) and more than the bottom 118 (of roughly 225) cable networks combined. What’s more, this figure is up an estimated 40% (or 38 billion minutes) year over year. Netflix is able to achieve this scale and rate of growth because in consumers’ minds, it is the Disney Channel. And AMC. And Syfy. And National Geographic. At first, Netflix’s streaming service was seen as a Pay TV competitor. Today, it’s most often viewed as premium cable network such as HBO (Netflix CEO Reed Hastings loves to make this very comparison). Yet it’s more accurate to describe the company as a multi-channel network group – a Time Warner or NBCU, not an HBO or USA. This approach flies in the face of the existing network playbook. Conventional wisdom says that specialized brands are better at building audiences, programming, marketing and ad sales (not to mention brand-wide carriage negotiations). Yet at the same time, it’s not clear that consumers value any of these supposed advantages. If a network could satisfy multiple genres, might that be preferred? User behavior/consumption data becomes far richer and expansive. Netflix says it green-lit House of Cards because it knew their users loved Kevin Spacey, David Fincher and the BBC original. Would any cable network today be able to know the same? Or are they stuck just knowing each in a silo? Some of this can be solved without consolidating brands or web assets, but these solutions are far harder to leverage than to technically implement. Content decisions will still be made in silos and under the impression, for example, that a Showtime viewer would watch more Showtime if more “good” Showtime content were available – even if they might really want to watch more of CBS. In a multi-network world, the best that a network group head can hope for is to optimize each individual network. Netflix, meanwhile, programs holistically for and across its entire subscriber base. In a linear environment, there will continue to be considerable (and tangible) corporate value in an entertainment group offering multiple distinct channels. But as bundles break apart, audience fragmentation exacerbates and consumption continues to shift to less valuable mediums (e.g. Netflix, YouTube), this strategy will become a missed opportunity and eventually, a liability. Furthermore, Netflix is focused not on channel optimization or profit maximization, but on a much more powerful end goal: owning the full extent of a consumer’s premium video experience. When we sum up the many networks owned by each media conglomerate, we can see how mighty these giants truly are. Netflix may be the largest “cable channel” by more than 100%, but it ranks 7th among cable television groups. Add in broadcast, and the delta is even greater. Not only is Disney more than three times as large as Netflix, but the OTT service makes up only 5% of total US video consumption per month. It may be that no single channel has the breadth of content and scale to be a serious Netflix competitor, but their parents certainly do. Unfortunately, these television groups remain organized in ways that reflect the limits of yesteryear, not the possibilities of tomorrow. While this approach still makes sense (it does optimize short-term affiliate fees and advertising revenue), it also prevents these groups from leveraging their entire portfolio in order to create better consumer experience or offering. Furthermore, this tunnel vision allows SVOD aggregators (such as a Netflix) to rebundle this same network content to create such a cross-network service. 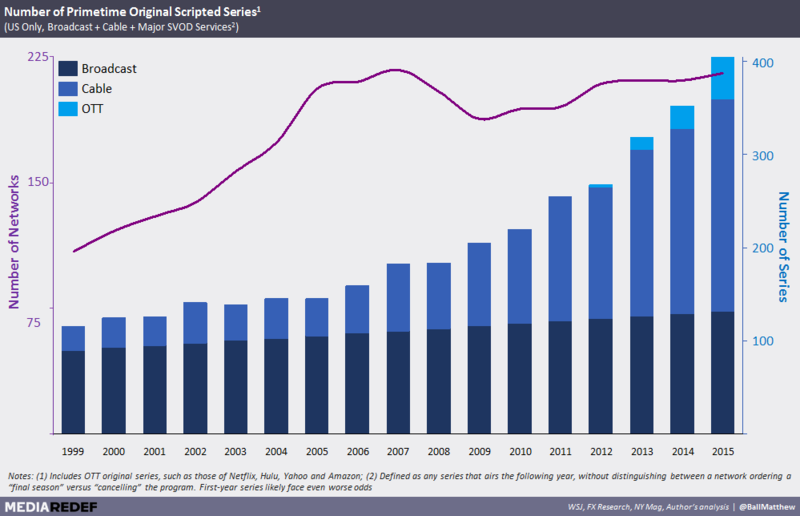 Few TV fans may know that both USA and Syfy come from NBCUniversal, but they do know that they love Netflix: the upstart is already bigger than both A+E and Scripps – and while linear TV ratings continue to erode, Netflix is growing its minutes delivered by roughly 40% each year. Over the past 15 years, the entertainment industry has experienced an explosive increase in the amount of original content. A portion of this growth stemmed from the proliferation of basic cable networks (from roughly 30 in 1990 to roughly 200 by 2005), but the rest was prompted by what might be called “the AMC effect.” In the seven years since the network debuted its first original series, Mad Men, AMC has increased its per subscriber carriage fees by more than 75% and total ad revenue an astounding 188%. Though no networks have been able to emulate AMC’s level of success, the rush to original content is now ubiquitous. In 2014, US audiences will be able to watch more than 400 original scripted primetime TV series – nearly twice as many as in 2007. Thanks to the rise of digital distribution and proliferation of portable multimedia devices, American audience are able to consume more video content today than ever before. However, appetites have not grown nearly enough. Exacerbated by the ever-increasing fragmentation of audiences (not just across linear channels, but to the likes of YouTube) and the renewed relevance of old content (see HBO’s recent HD rerelease of The Wire), the TV business has seen a nearly 400% increase in original series failure rates. At the turn of the century, nine out of every ten TV series would return the following year. Today, only five will. Faced with such daunting odds, original content “table stakes” continue to intensify. A few years ago, the idea of watching two-time Academy Award winner Kevin Spacey in an ongoing series seemed groundbreaking. Today, it’s not just commonplace, it’s widely seen as essential to convincing audiences that a show would be worth their time. The rush to “brand-name” talent doesn’t end at the cast, either. A-List Hollywood directors are increasingly involved with small screen content (this past year alone saw series from Oscar winners Martin Scorsese, Steven Soderbergh, David Fincher and Alfonso Cuaron), as well as celebrities such as Mick Jagger and Jonathan Franzen. Similarly, TV shows – from Lost to Game of Thrones and House of Cards – now pursue a level of cinematic production quality that can rival that of Hollywood blockbusters such as Cast Away, Robin Hood and The Ides of March. To ensure awareness among a field of hyper-credentialed new series, most networks have also massively increased their marketing spend. A year ago, TNT blanketed much of downtown New York City and Los Angeles with ads for Mob City (which was written and directed by The Shawshank Redemption and The Walking Dead’s Frank Darabont). Even still, the show premiered to only a 0.6 rating (or 2.3M 18-49s), placing it in an anemic 6th place in its timeslot. “I joke that as a marketer, I wish I’d appreciated five years ago, even three years ago, how much easier it was to launch and sustain a show,” Alexandra Shapiro, Executive Vice President Marketing & Digital at USA, told the New York Times last summer. Soaring cancellation rates have also made audiences wary of investing in new series. With so much good content already available, why try a show that might only survive a few episodes? And if it does survive, you can always catch-up on the first season on Hulu, Netflix or your DVR. Unfortunately, this creates a vicious circle for programmers in which potential audience builders become indistinguishable from the duds (as if identifying commercially viable creative content wasn’t hard enough). To combat this, many networks have begun renewing programs after only a few episodes or before the pilot even airs. Though this helps to combat viewer cynicism, it substantially increases the cost of a failed series. This problem has escalated even earlier in the programming lifecycle, too. Due the high failure rates and potential halo-effect of an Orange is the New Black or Breaking Bad, networks have been consistently sweetening their bids for the most promising series. Put pilots, straight-to-series and full-season orders have become the new cost of doing business. If increased risks of failure and higher series costs (both upfront and ongoing) weren’t enough, the upside continues to diminish. There will still be hits like The Walking Dead and Game of Thrones for the foreseeable future, but no matter how good a show is, ad revenues will continue to fall, audiences will continue to fragment, and consumption will continue to shift outside of prime viewing windows. As the cable bundle breaks apart, it will also become even harder for networks to build and expand their audiences. 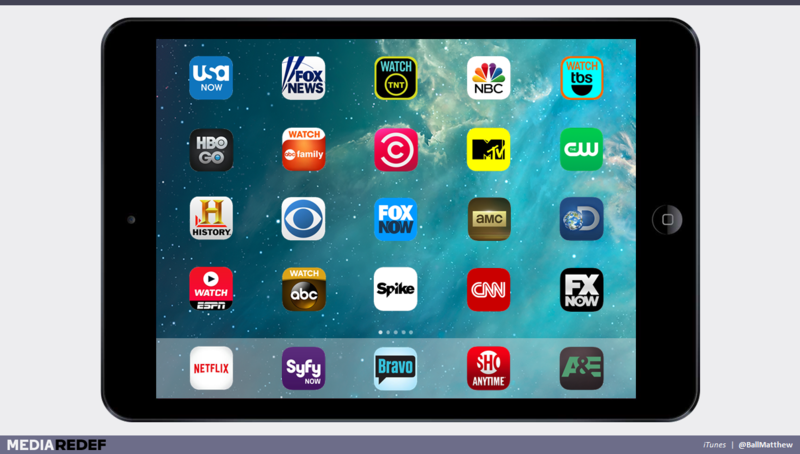 Rather than being only a channel surf away, many networks will need the viewer to order a new channel or add a new app. Given the wealth of content already at their literal fingertips, this will be a serious impediment. Simply said, another AMC-style rise may no longer be possible. And even if a network or show does come to prominence, the programming cost structure (including the allocated costs of failed shows) may not be sufficient. The pursuit of ratings (and individual channel empires) at any cost simply cannot continue. The typical network response to this strategy has been simple: “Amazon and Netflix have different business models. They’re focused on subscriptions, not CPMs, not carriage”. That may be true, but in reality, whether content is consumed via OTT, VOD or Live Linear, all video consumption will soon be “on-demand”. There is simply too much content, too much choice and too much “good TV”. It doesn’t matter if the goal is to sell consumer attention to advertisers, capture consumer spend or cross-sell other products, a network’s needs are the same: to routinely engage and retain its (identifiable) viewers. Achieving this goal in an on-demand digital era will require network groups to focus on the holistic needs of their viewers, not their own individual network priorities. Most notably, this means establishing unified digital brands and assets that can leverage the full extent of a group’s content portfolio and many customer interactions. However, it also means rethinking ideas such as whether a family sitcom viewer is actually best served next by another family sitcom; if filmed entertainment is truly all art, no science; whether the number of timeslots should determine how much (or how little) programming is needed; and if performance metrics can really be reduced to a single age group and number. This vision is certainly antithetical to present day network television, which has spent decades defined by Nielsen ratings, channel proliferation and four-quadrant hits. But that’s the point. “Television” has finally been freed from the confines of the past. It can now be as rich, personal and multi-genre as any given viewer wants. Oddly enough, it’s the “established” TV giants, flush with cash, IP, and portfolio scale, that are best positioned to create this experience. It may still be early for this transformation, but it’s essential that they start planning today. Tearing down channel and demographic silos, building common back-ends, establishing new performance metrics, and resetting time-tested portfolio strategies will all take time. And Netflix isn’t slowing down.